Jan Josephsz. van Goyen is considered to be one of the leading 17th-century Dutch landscape painters. Among his teachers was Esaias van der Velde in whose Haarlem workshop he spent around one year. 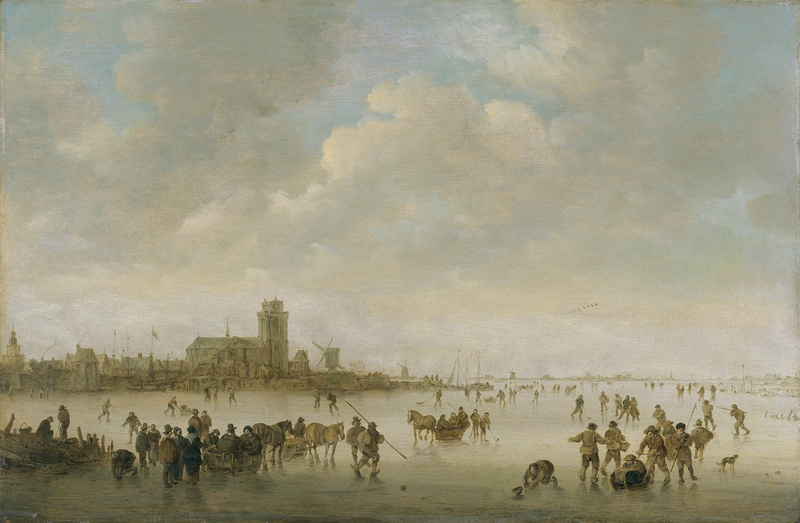 Van der Velde’s style is evident in Van Goyen’s early work and in the subject matter of some of his views, particularly those related to the seasons. Van Goyen was also one of the leading exponents of the so-called tonal painting, an approach that is fully consolidated in his paintings of the late 1620s. At this period the artist produced simple compositions in which he captured images of everyday life in a natural setting dominated by man. He used lower horizon lines at this date and placed most emphasis on the sky and the atmospheric effects, while his views are bathed in a uniform tonality of browns, greys and greens that give the paint surface an almost monochromatic appearance. The present panel, which is signed and dated 1643, is a fine example of his mature style. In the 1640s Van Goyen’s style changed with regard to his work of the previous decade and he discarded the diagonal lines that he had previously used to create depth. He also modified the colouring that he had deployed to create striking atmospheric effects. His views of the 1640s, such as the present example, have broader horizons and open onto huge areas of land.His earlier diagonals are now replaced by an interplay of horizontal lines such as the ones here that create the precise horizon and strip of land on which the city is located. The city in this view has been identified as Dordrecht. The large building that looms over the rooftops of the small houses and windmills on the riverbank is the Grote Kerk seen from its north side. This Protestant church was burned in 1457 and rebuilt between 1460 and 1502. Van Goyen emphasises its basilical ground-plan and its heavy tower which does not have the traditional spire due to the unstable land on which it is built. The frozen terrain in the foreground is the river Oude Maas or Old Maas. The view, like all those by this painter, was devised and painted in the studio on the basis of numerous preparatory drawings that Van Goyen made on his sketching trips. Gaskell noted that in the early 1640s Van Goyen, who was living in The Hague, returned to winter scenes and painted a large number of views of icy views with Dordrecht in the background. Gaskell also noted the importance of the numerous figures on the frozen surface of the river. Engaged in their normal activities such as transporting merchandise, they also have time for amusement, for example, the kneeling figure on the right who prepares to fish or the boys with long poles about to engage in a game. These figures are depicted in correctly diminishing proportion and thus help to emphasise the ordered recession of the pictorial space.